It's always been Mimi Rousseau's dream to open her own bistro, but it seems beyond her grasp since she's been chased back home to Nouvelle Vie in Napa Valley by her late husband's tremendous debt. Until her best friend Jorianne James introduces her to entrepreneur Bryan Baker who invests in promising prospects. Now, working the bistro and inn until she's able to pay it off and call it her own, Mimi is throwing the inn's first wedding ever. The wedding will be the talk of the town, as famous talk show host Angelica Edmonton, daughter of Bryan's half-brother, Edison, has chosen the inn as her perfect venue. Anxious, Mimi is sure things are going to turn south, especially when Edison gets drunk and rowdy at the out-of-towners' dinner, but by the evening, things begin to look up again. That is until six AM rolls around, and Bryan is found dead at the bistro with an clair stuffed in his mouth. And the fingers point at Mimi, whose entire loan is forgiven in Bryan's will. 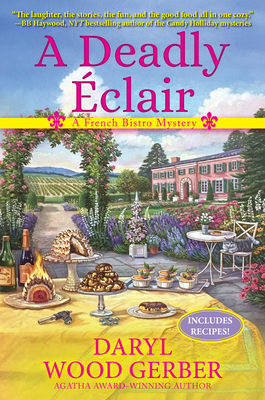 Now it's up to Mimi to clear her name and get to the bottom of things before the killer turns up the heat again in A Deadly clair, the scrumptious series debut by Agatha Award-winning author Daryl Wood Gerber.